Established in the fall of 2016 as part of the Moving Dartmouth Forward initiative, the housing communities have become a key source of community and involvement for many students. On Oct. 9, former chair of the Federal Deposit Insurance Corporation Sheila Bair spoke with former undersecretary of the Treasury and current Tuck Business School professor Peter Fisher as part of a public lecture entitled “Ten Year Anniversary of the Financial Crisis,” sponsored by the Rockefeller Center for Public Policy. Bair served as chair of the FDIC from 2006 until 2011, leading it through the financial crisis of 2008, which many economists regard to be the worst financial crisis since the Great Depression. On Monday, Oct. 1, the College released the 2018 Clery Act Security and Fire Safety Report, reporting campus crime statistics from 2015 to 2017. 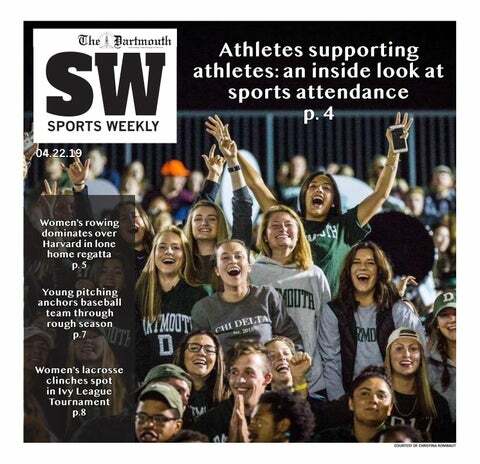 Enshrined in the mission statement of the Dartmouth Outing Club, in addition to its commitment to fostering student community and leadership in the outdoors, is the principle of environmental stewardship. Future quantitative social science majors will no longer be required to complete a thesis before graduating. Over the past two weeks, students have noticed the disappearance of an important staple at Dartmouth Dining Services locations across campus — plastic straws. “Sophomore summer is the new freshman fall.” That’s Jake Klein ’20’s motto for Strips 2018, which he will direct alongside three other sophomores. “An effervescent, magnetic, amazing human being with a heart of gold,” associate director of Dartmouth’s Center for Social Impact Ashley Doolittle said of Sabyne Pierre ’20. This past weekend, Dartmouth College Hillel celebrated the 20th anniversary of the Roth Center for Jewish Life, which opened in 1998 following a donation by Steven Roth ’62 TU’63. Earlier this month, Folk — a small retail shop located on Allen Street in downtown Hanover — announced its plans to close at the end of the spring or early summer.